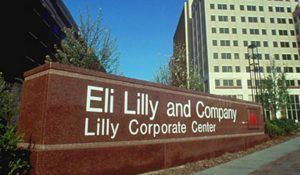 A new drug from Eli Lilly (NYSE:LLY) has reached its main goals in late-stage clinical trials, according to a statement from the company released Friday. The drug, galcanezumab, was in three Phase 3 clinical trials. Galcanezumab is part of a new class of drugs that interfere with a protein thought to play a role in transmitting pain. Blocking this protein is believed to stop the onset of migraine pain. Migraines are one of the most common neurological disorders. Data from the Migraine Research Foundation shows that migraines affect 38 million people in the U.S. Roughly 13 million patients are afflicted with a severe form of the condition. The condition affects three times more women than men. Migraines can last from several hours to several days. The affected suffer symptoms that extend beyond head pain, including vomiting and disturbed vision. In addition to the healthcare costs associated with treating migraines, lost productivity from migraines costs the U.S. an estimated $13 billion annually. Few effective treatments to manage migraine episodes are currently available. Eli Lilly’s trials involved patients who experienced episodic and chronic migraine headaches. The patients in the study had an average of 19.4 migraine headache days per month at baseline. Patients were randomized to receive either the new drug or a placebo over a three-month treatment period. While the injectable drug did not stop migraines from developing entirely, patients given the new drug experienced fewer headaches per month compared to the group that received a placebo. Eli Lilly says its drug beat a placebo at both the 120 mg and the 240 mg doses. The company reported that patients with chronic migraine getting once monthly 120 mg doses experienced a reduction of 4.8 days from baseline in monthly migraine days, while those on 240 mg experienced reduction of 4.6 days. Those given the placebo experienced a reduction of 2.7 days. The drugmaker now plans to file for FDA approval of the drug in the second half of this year. The company also plans to submit the data to peer-reviewed journals and present it at future scientific meetings. Shares of Eli Lilly rose 1.6 percent in premarket trade Friday, after the announcement. The company’s shares have gained 9 percent in 2017 through Thursday. Several other companies are testing similar drugs. Allergan paid $250 million to acquire a similar compound from Merck two years ago. Alder Biopharmaceuticals reported positive results from a mid-stage clinical trial of its drug, ALD403, last year. Amgen reported successful results from its second Phase 3 trial of its new drug, called erenumab, last November.